Shopping for vintage or antique furniture online can be extremely tricky unless you are an appraiser with the appropriate expertise. So, whether you are a first time collector or a seasoned antique shopper, these tips from six experts will help you avoid a terrible case of buyer's regret. 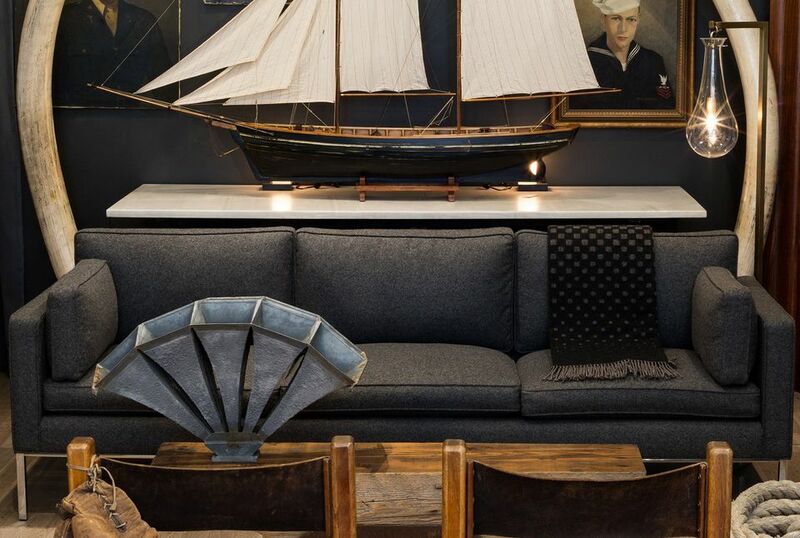 "When shopping online for vintage or antique décor, it is all about the small details," says Gretchen Murdock, the owner of San Francisco interior design firm, Modtage Design. She suggests never buying anything on sites like Etsy or eBay unless you see multiple photos of a particular item that verify essential details regarding age, quality, and maker. "For example, true vintage or antique wood furnishings are more likely to have dovetail joints or detailed inlays of different wood types," she adds. Murdock also says savvy shoppers should keep their eyes peeled for imperfections when a vintage or antique item is being promoted as handcrafted and not machined. If something looks too perfect, it should set off alarm bells about an item's authenticity because knockoffs and reproductions rarely have those beautiful, yet distinctive imperfections typical of handmade items. Labels or stamps on the bottom or back of an item will also help you determine an item's authenticity says, Murdock. To avoid being duped, she suggests doing a little research to ensure any labels shared in a photo with a product's description are not fake. There are plenty of blogs, websites, and books about vintage and antique marks that will help inform your buying decisions. Brian and Luke, the owners of S16 Home, a brick and mortar store and online retailer out of San Francisco, California take great pride in their meticulously curated collection of vintage and antique décor. They say all of their offerings reflect their belief that our personal stories can be told by the objects we surround ourselves. Here are their suggestions for avoiding pricey mistakes when buying vintage and antique pieces. First and foremost, they both agree that reputable online dealers will do all the research that verifies the authenticity of a particular item for buyers. "We know how difficult it is to spot a fake or knockoff, that is why we take time to research and describe the history of our collection to our online customers. Whether it is the manufacturer's unique techniques, the creator's personal story, or the historical context of a piece, we see the value in sharing as much information as we can with the collector community," says Luke. We assume that is the big reason for their store's five-star Yelp rating. The duo also suggests taking your time when shopping. "It is tempting to make a rash purchase with something as unique as a vintage item, but we would suggest gathering as much knowledge and information about the piece before you jump in," adds Luke. "There are plenty of great resources online for discovering information about vintage items." A favorite trick is seeing if the piece you are interested in is listed with the Smithsonian (we also suggest checking the Museum of Modern Art in New York City). Another smart idea for verifying an item's authenticity is to join a chat room with other enthusiasts or even contact retailers like Brian and Luke. When people reach out to them for advice, they say, "We're happy to pass on any information we've gathered over the years of selling." Another shopping tip that will help you buy with confidence is scrutinizing photos. They suggest never buying items that do not have clear images of all angles including the bottom. "If an object is not represented adequately in the images, then do not be afraid to ask for more pictures. If a retailer wants to make the sale, they will get them to you ASAP. Jennifer McDermott, the consumer advocate for the shopping comparison website, Finder, helps people to make better decisions with their money, including while shopping. She offers the following advice. "If it looks too good to be true, it probably is. Good quality, vintage or antique pieces are not typically cheap. If something seems suspiciously inexpensive, it is likely counterfeit." She also suggestions reading through the online feedback for retailers or sellers. "Reputable sellers typically have numerous reviews and a high rating. While this can be possible to fake, combing through them will usually help a consumer to determine if the company is trustworthy or not." One big red flag adds McDermott, are companies with lots of reviews created within a very short time span — especially those with many comments that feel almost identical. Even if you did your research before buying a vintage or antique item, does not mean you will not suffer a bad case of buyer's regret. What can you do? Do business only with outlets or sellers that offer a money-back guarantee. "eBay offers reimbursements within 30 days of receiving an item that is not as described," she says. But that offer could potentially be null and void based on the product's description. McDermott suggests reading product descriptions numerous times before buying. "It can be easy to miss things in an item's copy when you are not expecting to see them. Descriptors such as vintage-style or antique-inspired are a giveaway that the product is not genuine." Justin Lavelle, Chief Communications Director of Been Verified, provides expertise on preventing scams and financial fraud. He says," Unfortunately, scammers take advantage of unwitting customers on sites like eBay, Amazon, and Facebook Marketplace. "Nearly 42 percent of goods sold online are deemed fakes or knockoffs according to the U.S. Government Accountability Office by third-party sellers." problem with your goods and they turn out to be fake, PayPal will make sure you get your money back. Using the service is especially useful for high-value purchases because it offers buyers real peace of mind." He also strongly suggests reading buyer feedback. But not just the positive comments. "Unhappy buyers are more inclined to leave very detailed comments, especially if they have been jilted." Also, reading customer reviews is a great way to confirm the type of products the sellers usually offers — if you see a mishmash of random products from different shopping categories that could also be a huge red flag. Lavelle also suggests working with an appraiser if you are going to drop a large sum of money for an online item. "An appraiser will help you determine if the item is worth the asking price. Most trustworthy online appraisers will charge you $10-30 per item to be appraised. So it’s well worth the money for many people. If you decide to get an appraiser’s opinion, find one that is accredited, meets professional and ethical standards, and offers online reviews of their work." Several websites offer estimates by professional appraisers and other experts in areas as diverse as antique furniture, political memorabilia, and vintage toys. The process is simple. All you need to do is upload photos of your items and provide descriptions. The appraiser sends back valuations, not authentications, usually within a week. To avoid being scammed by an appraiser, Lavelle says you should avoid working with anyone who asks for a fee based on a percentage of the item’s value. New York City architect John Mochelle, avoids bidding sites when shopping for vintage and antique items online. "You can easily wind up paying more than an item is worth because of the competition created by online bidding." "If I see a piece I love online but not its high price tag, I reach out to the merchant and try to haggle a better price. Sometimes the answer is no, but there have been many times when a seller has offered a discounted price, especially when I am purchasing multiple items from them." The most important to need to know when haggling? "Be nice," says Mochelle. "Being demanding never works. But a great attitude will help you establish a great business relationship with a seller." It is especially important if you are or plan to become an avid collector. "Over the years I have established good relationships with several online vintage and antique dealers. These people are familiar with personal tastes so now they give me first dibs on certain items before putting them on the sales floor." It proves that being nice is a win-win. Ace Hardware vs. Home Depot? This May Surprise You.